Safedome Classic makes looking after what's valuable to you, easy. Whether you've left your wallet at home, lost your phone down the back of the couch or misplaced your bag on a busy shopping day. It's your own personal backup before losing something turns into a real problem. 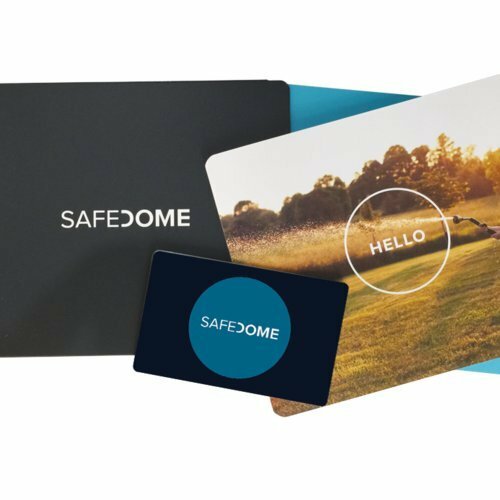 Made with the highest quality components combined with great design, the Safedome Classic card is Bluetooth tracking tech at it's best. THIN AS A CREDIT CARD - At 0.76 mm the Safedome Classic card fits into your wallet or purse just like a normal credit card. You can also attach it to your laptop, tablet case. FIND YOUR WALLET - The Safedome Classic card will help find your missing wallet, phone, or bag in seconds. The app alerts you and shows the missing items location on a map. FIND YOUR PHONE - Misplaced your phone? Simply press the button on your Safedome Classic card to make your phone ring, even if it's on silent! IOS AND ANDROID - The app works seamlessly with all smartphones. IMPROVED BLUETOOTH CONNECTIVITY - Safedome Classic has been revamped to offer improved signal stability and strength between the card and your smartphone for even more peace of mind. If you have any questions about this product by Safedome, contact us by completing and submitting the form below. If you are looking for a specif part number, please include it with your message.